Our Custom designed and constructed Alfresco Insulated Pergola built for our client in Seaforth has us dreaming of summer time. Client Brief – Create a seamless extension of their indoor living space, while creating a bold outdoor living area for the family to enjoy in all weather conditions. Our Insulated Alfresco is built using powder-coated aluminium framing in monument, to match the home’s existing colour palate. The posts and beams are large in size to create a wow factor when you step out of the back door. 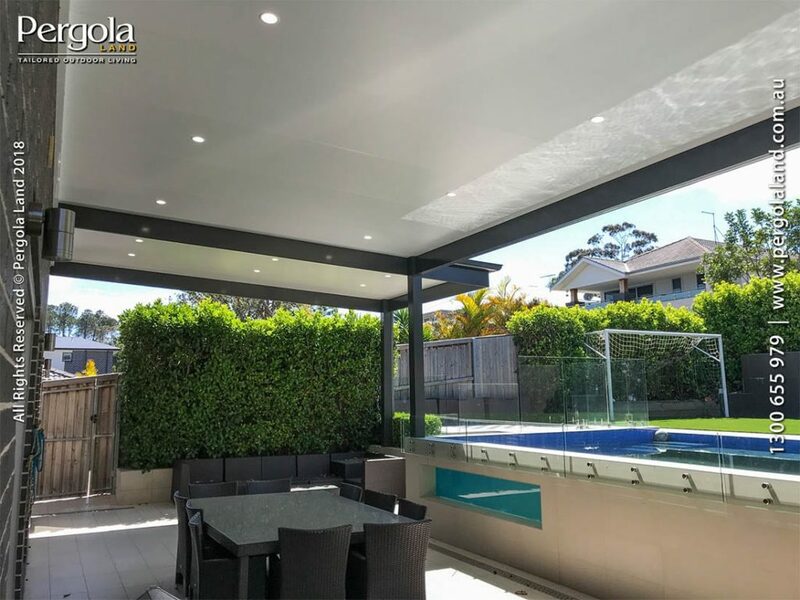 To fit the client’s brief of creating an area to be usable all year, our team has created a flat style Alfresco pergola and fixed it directly to the house. This creates a tidy, waterproof entertaining area. Protected from all the elements. We have used Insulated roofing panels to keep the area cool in summer and warm in winter. Our client can sit back and watch the kids playing in the pool in summer, but still entertain outside in the cooler months. To finish off this ultra modern Alfresco area, we added LED downlights, fitted by a qualified electrician.